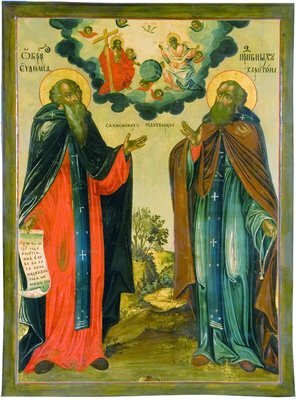 Saint Euthymius and his disciple Saint Chariton lived at the River Syanzhema during the close of the fifteenth and the beginning of the sixteenth centuries. 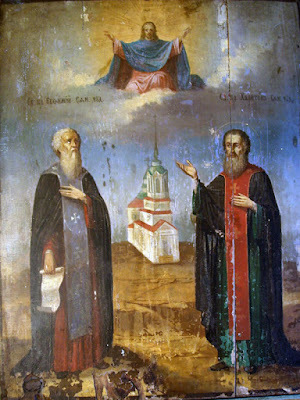 Saint Euthymius came to the Spasokamensk Monastery from the outskirts of Volokolamsk. For a long time he continued as a novice at the monastery, but later he settled on the eastern shore of Lake Kuben near the mouth of the River Kushta. The Saint built a small cell in the impenetrable swamps and dense woods, where he struggled in total solitude. After a while, Saint Alexander of Kushta (June 9) came to him. He also had set out from the Spasokamensk Monastery and at first settled at the River Syanzhema. Saint Alexander entreated Saint Euthymius to switch cells with him, since he was seeking a place of complete quiet. Moving over to the River Syanzhema, Saint Euthymius did not refuse the local people his spiritual counsel and guidance. And there Saint Chariton also came to him. Saint Euthymius built a church in honor of the Ascension of Christ and founded a monastery next to it. At Rostov, with the blessing from Patriarch Dionysios of Constantinople (1418-1425), he received the permission to build. Evidently, he was also ordained to the holy priesthood, and was made abbot of the monastery he established. Both monks were an example to the brethren in prayer, and in the works of construction and supervision. They made do with food and clothing that even the brethren regarded as worthless. In church, Saint Euthymius stood in fear and trembling, and the brethren often saw tears of tenderness upon his face. While working at handicrafts, the Saint always sang Psalms. Saint Euthymius died around the year 1465, though the actual day of his death is unknown. 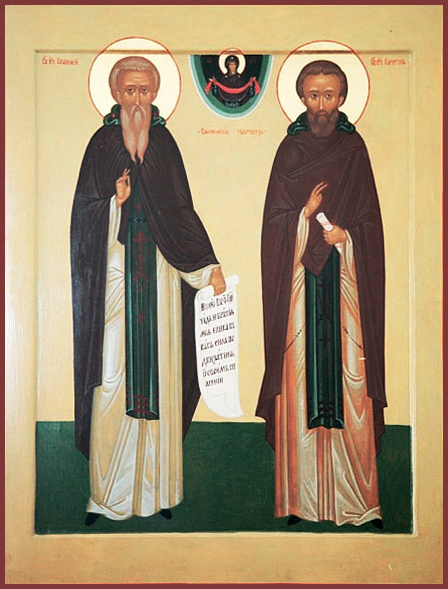 His successor as abbot was his beloved disciple Saint Chariton. For more than forty years he continued the work at the monastery, and he died in old age on April 11, 1509. Both monks were buried at the Ascension Church. The memory of Saint Euthymius is celebrated on January 20, and that of Saint Chariton on September 28, when their patron saints are commemorated.